Home Respiratory System What Is Pleurisy? Also called pleuritis, pleurisy is a condition that comes about when the linings of your chest and lungs are swollen. Back in the day, this condition was a common complication brought about by bacterial infections, especially pneumonia. With the introduction of antibiotics, prevalence rates for this condition have substantially dropped. However, there are some renowned people who have had pleurisy and some even lose their lives from it mostly because the healthcare during that time was quite low. Some of these people include Catherine de Medici who lost her life from it, Elvis Presley had recurring pleurisy, Mahatma Gandhi and Benjamin Franklin died from it, William Wordsworth and Hernan Cortes who also lost his life from it. Pleurisy tends to make it difficult and painful to breathe and is sometimes associated with a condition known as pleural effusion. Pleural effusion is a condition where the spaces between the layers of the membranes are filled with fluid. The double-layered pleurae lubricate and protect the lungs surface as they deflate and inflate within the rib cage. In normal conditions, the fluid-filled thin gap, known as pleural space, enables the two pleural membrane layers to gently slide past each other. However, when the layers get inflamed, each breath, cough or sneeze, causes the roughened surfaces to painfully rub together like two sandpapers would. There are some cases where excess fluid oozes to the pleural space resulting in pleural effusion. This buildup of fluid normally has lubricating effects and thus relieves the pain since it helps to reduce friction between membrane layers. On the other hand, added fluid pressurizes the lungs thus reducing their ability to freely move. If there is a lot of fluid, the patient may experience shortness of breath. There are some cases that excess liquid can lead to infection. The symptoms linked to pleurisy include a cutting, sharp pain when you inhale or exhale. This pain might subside when you pressurize the painful section or hold your breath. However, it gets worse when you move, cough or sneeze. Appetite loss, chills and fever are also possible symptoms depending on the condition causing pleurisy. Pleurisy can be accompanied with fluid buildup (pleural effusion) that pressurizes your lungs thus preventing them from working properly. This fluid might act as cushion, helping the pain reduce or disappear. However, you will eventually experience shortness of breath as the fluid increases. You may also experience dry cough, chills and fever. These symptoms can indicate empyema (fluid infection). Consult your doctor if you are worried about chest pain. Many causes of chest-pains are not only dangerous but also life-threatening. If you have a cough, shaking chills and high fever that produces yellow or green sputum, there is likelihood that you have pneumonia. Consult your doctor. He may suggest a chest x-ray. Risk of having another disease along with pleurisy increases with age and presence of other life-threatening conditions such as diabetes, chronic bronchitis, emphysema, heart disease and collagen vascular diseases. If your arm or leg is swollen when you have pleurisy, you probably have pulmonary embolus and deep venous thrombosis. You should always see your doctor if you have chest pain, more so if there is shortness of breath, you feel lightheaded, you are in pain that prevents you from moving around comfortably or you have chest pain. 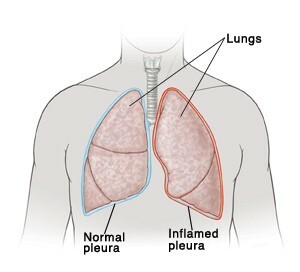 Pleurisy comes about when the pleura gets inflamed and irritated. This results in friction between the two pleural membrane layers. It is usually painful when you exhale and inhale. The pain stops or lessens when you hold your breath. An infection can inflame part of the pleura which will cause pain. If you are suffering from ‘viral pleurisy’, you are not very ill. You may experience fever, cold, cough i.e. flu-like symptoms that are caused by the virus. However, the pleuritic pain you feel can be very severe. Your body’s immune system usually clears viral infections and the pain will typically last for some days and disappear as the viral infection is cleared and inflammation is settled. Pleuritic pain can also be as a result of serious condition. Anything that will cause damage or inflammation to your lung’s edge (next to pleura) can lead to pleuritic pain. For instance, pulmonary embolism (blood clot in lung), lung cancer, inflammation linked to arthritis, chest injuries, pneumothorax (collapsed lung) and pneumonia can cause pleuritic pain. All these conditions will likely come with other symptoms and pleuritic pain will be just a fraction of the problem. Pleurisy treatment normally involves relieving the pain and treating the condition’s underlying cause. If pleurisy is promptly treated, it resolves without causing damage to your lungs. Chest pain can be treated with NSAID painkillers, the most common one being ibuprofen. If the NSAIDs prove to be unsuitable or ineffective, your doctor may prescribe another painkiller like codeine or paracetamol. It may sound strange, but when you lie down on the chest-side that is in pain, the pain may reduce. If the pleurisy is bacteria-caused, you will need antibiotics. The antibiotics may either be in form of injections or tablets, but this depends on how severe the symptoms are. Normally, a combination of various antibiotics is used. If the pleurisy is virus-caused, you will not need further treatment. This is because the infection normally resolves on its own after some days. If the symptoms are severe or you are not in good health, you may require hospital admission so that the functions of your body can be supported till the condition is stable. If pleural effusion does not clear when the pleurisy is being treated, or if there is shortness of breath, a tube will be used to drain the fluid. The tube can either be inserted using local anesthesia (the area of insertion gets numbed) or general anesthetic (you are asleep).